Sulfur (pronunciation: SUL-fer) is a yellowish powdery or crystalline element belonging to the family of Chalcogen and nonmetals in the periodic table and is represented by the chemical symbol S [1, 2, 3]. Although pure sulfur is odorless, the bad smell linked with the element comes from some of its compounds, including hydrogen sulfide (H2S) that produces the “rotten egg” smell and mercaptans (an organic compound) that gives the defensive odor in skunks . 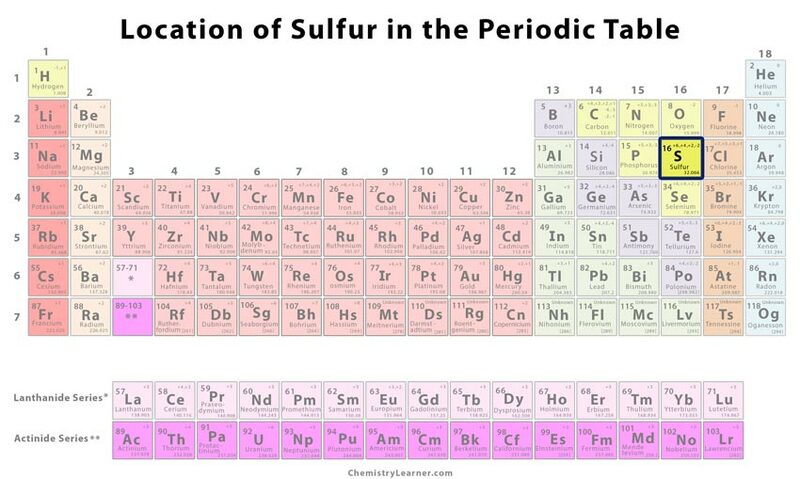 There are about 24 isotopes of sulfur, ranging from 26S to 49S out of which four are stable, including 32S, 33S, 34S, and 36S with natural abundances of 94.99%, 0.75%, 4.25%, and 0.01% respectively . Most of its radioactive isotopes are short-lived, except 35S that has a half-life period of 87 days . 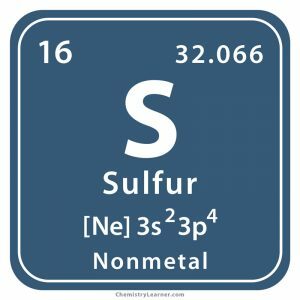 Sulfur naturally occurs as an element in volcanic areas and is also present in several minerals like galena, Epsom salts, gypsum, and iron pyrites . Earlier it was commercially obtained by using the Frasch process, which involved passing super-heated steam and melting the underground deposits of sulfur so that it could be collected on the surface in its liquid state . It is now produced during the purification processes of oil, tar sands, and natural gas wherein sulfur is separated . While sulfur is present in all living things, it remains in them after fossilization, like in fossil fuels [1, 4]. Origin of its Name: It is not known from where its name exactly originated, but it is believed to have been derived either from the Sanskrit word ‘sulvere’, meaning “enemy of copper”, the Latin word ‘sulfurium’, or the Arabic word ‘sufra’ meaning yellow [1, 4]. Who discovered it: Although its discovery is unclear, the element was known to the ancient humans, as it is mentioned in the Bible and was commonly used in many parts of Asia and Europe . According to the Bible, the Hebrew God destroyed the ancient cities of Sodom and Gomorrah, as burning sulfur (brimstone) rained from the heaven . The ancient Greeks used it as a fumigant, and in Sicily, it was used for preserving wine and bleaching cloth . For hundreds of years, sulfur, as well as salt and mercury, were believed to have comprised all the metals, forming the foundation of alchemy by which metals could be transmuted into one another . The French chemist Antoine Lavoisier believed that it was a new element, but could not prove it . In 1808, Humphry Davy thought it was a compound containing hydrogen . In the following year, Joseph Louis Gay-Lussac and Louis Jacques Thénard studied its characteristics and proved it to be a new element . 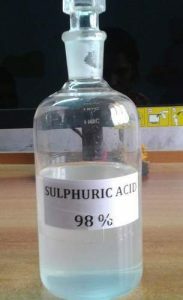 Sulfur is commonly used for the production of an essential chemical compound, sulfuric acid, which has many uses including the production of phosphoric acid for making fertilizers [1, 7]. It is used in the vulcanization process for making black rubber more durable [1, 7]. 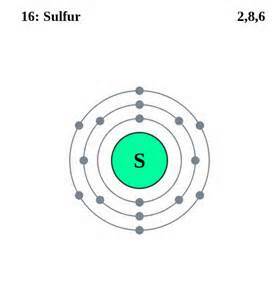 Sulfur is an important component in black gunpowder and fungicides [1, 7]. 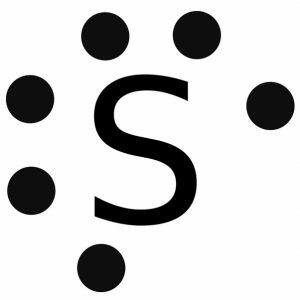 Because of its distinctive odor, sulfur is used in natural gas supplies for detecting gas leaks easily . Its compound, calcium sulfate, is mined for using it in plaster of paris and cement . Its sulfites are used as food preservatives and in bleaching paper . Many sulfate derivatives are commonly used as detergents and surfactants . While sulfur and sulfate are not toxic to humans, sulfur dioxide, hydrogen sulfide, and carbon disulfide are all considered to be poisonous . Hydrogen sulfide, in particular, is dangerous because it can cause respiratory paralysis, resulting in death . Sulfur dioxide, produced through the combustion of unpurified oil and coal and released into the air, causes acid rain, which can result in the death of living things in and around water bodies [1, 4]. The element itself is vital for all living organisms, as the plants and algae use sulfate from soil or water . An average human has 140 g sulfur in his body, obtaining it from the protein he takes (about 1 g/day) . Sulfur is graphically represented by an alchemical symbol with fire and brimstone in the background . The element constitutes approximately 3% of the mass of the Earth which is enough to create two additional moons . While it is insoluble in water, it does not easily dissolve in other chemicals [3, 4]. Since the large intestine in humans is full of bacteria, sulfur compounds are produced . It is the reason why the intestinal gas has a bad odor . Sulfur passes to and from the soil, rocks, waterways, and then through living things, which is collectively called the sulfur cycle . 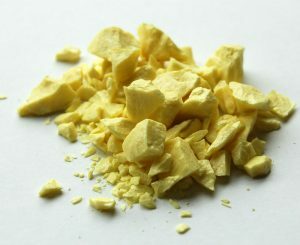 The price of pure sulfur is about $0.5 per gram, and in bulk, its price is about $0.2-$0.45 per gram .